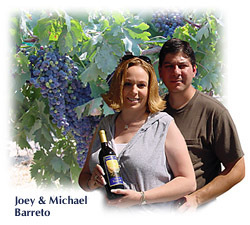 Founded by Michael and Joey Barreto, Barreto Cellars was established with the idea of becoming the leader in California producing high quality wines featuring grape varieties native to the Iberian Peninsula (Spain and Portugal). Because of relatives who migrated to America from these regions there is an obvious connection and desire to learn more about and develop wines utilizing these varieties. Many of these are unheard of in California except for a few elite growers and select winemakers. Currently we are creating wines in the New World style while trying to capture the truly unique characteristics each variety possesses. Each lot of wine is carefully hand-crafted from vineyard to bottle to bring the true sense of the vineyard to your glass. In an attempt to represent both Spain and Portugal equally, a red variety noted for each country is being produced. Spain is represented by the variety Tempranillo, the most widely planted wine grape in the world. The grape is mostly noted for its use in Rioja wines. There are over 15 different names for this grape in Spain alone, which may account for its lack of name recognition. Some of its aliases are Valdepe–as, Tinto del Toro, Tinto Fino and Tinta Roriz. Whatever it is called, it is easily associated with quality and fine wines, and with the ability to age for long periods of time. The main Portuguese red is Touriga Nacional. It is known as the basis for many renowned Ports but is finally getting recognized in the table wine arena as well. In recent years Port producers have had production quotas placed upon them. With the adoption of modern viticultural techniques, production and quality for the region has increased, leaving wineries with no other choice but use the excess grapes to make table wines. If you have had the opportunity to taste any of these wines it is easy to see that wine drinkers have greatly benefited from this decision. Other wines produced by the winery will be an ongoing quest for unique varieties that are well suited for the California climate and vineyard sites available. We look forward to exploring these wines with you. If you are ever traveling in the Paso Robles area of California please call to arrange a private tasting or keep checking back for a listing of events that we will be pouring our wines.